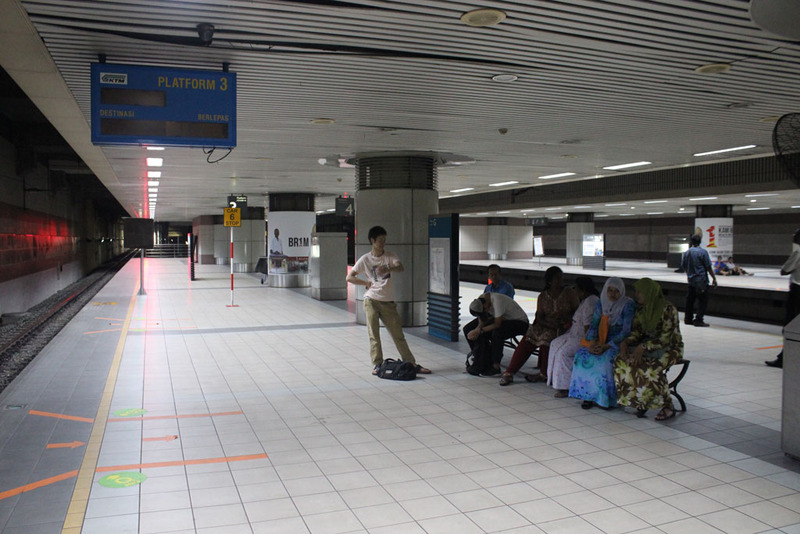 After we finished our meal, we went down to KTM Komuter platform to catch the train to Batu Caves. This is the first time that I’m traveling to Sentul branch since the last time I went there in 2004. It’s surprising that the train still depart from the same platform! 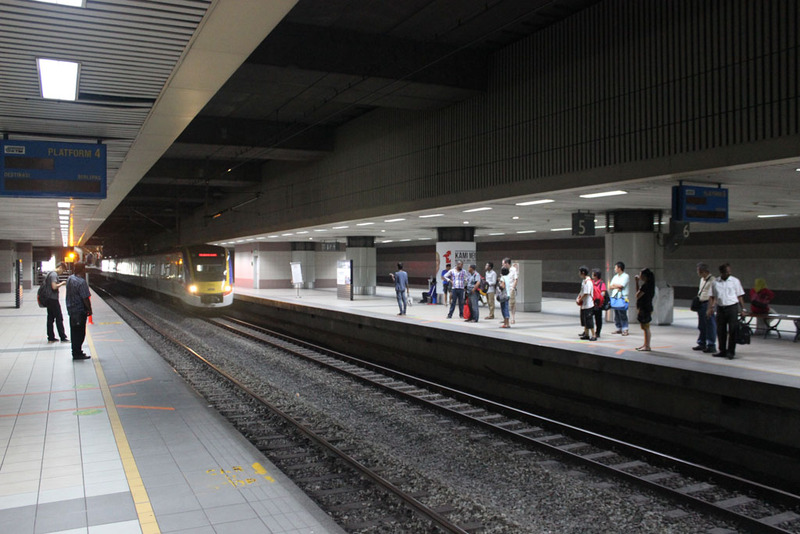 The platform still looks immaculately maintained….well, almost. Unless if you notice the ceiling. 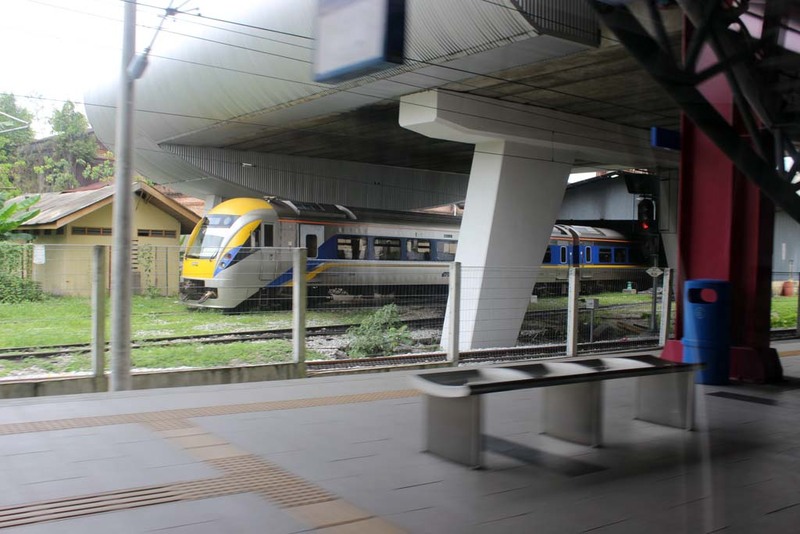 What makes the difference is the type of trainsets used for KTM Komuter service. 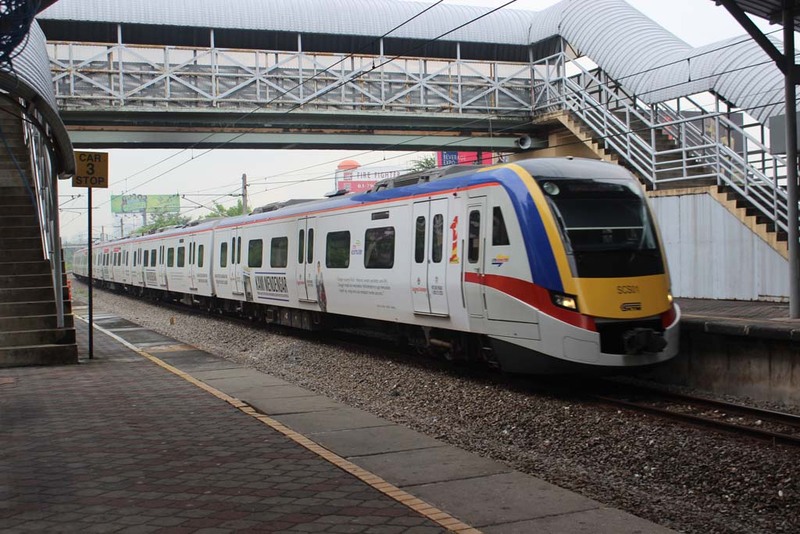 Back in 2004, KTM used variety of EMU. 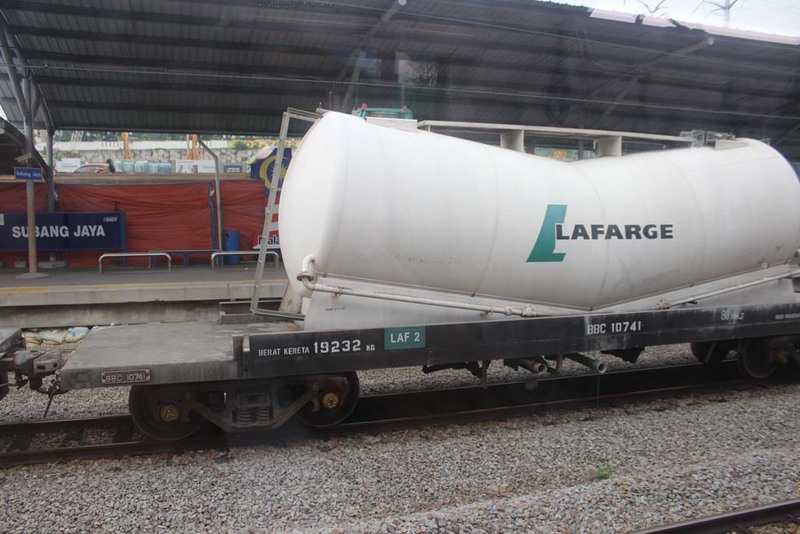 They were made by Hyundai (Korea), Jenbacher (Austria), and Union Carriages (South Africa). 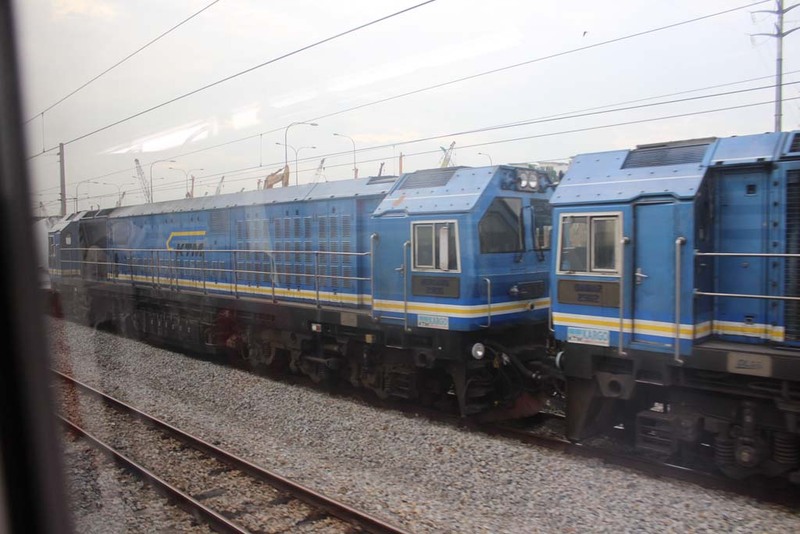 But from 2012 onward, they used these Chinese built EMUs. 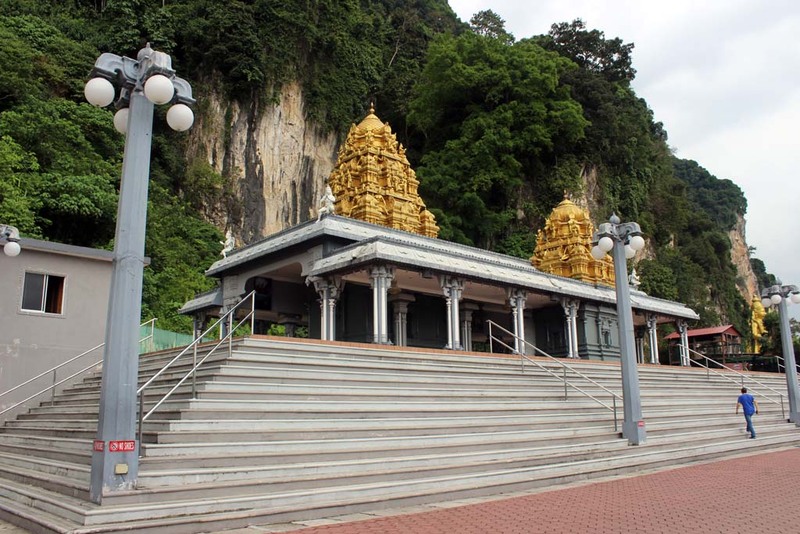 Once our train arrived, we boarded the train to Batu Caves, on Sentul branch. As the train entered the branch, I saw this connection track. 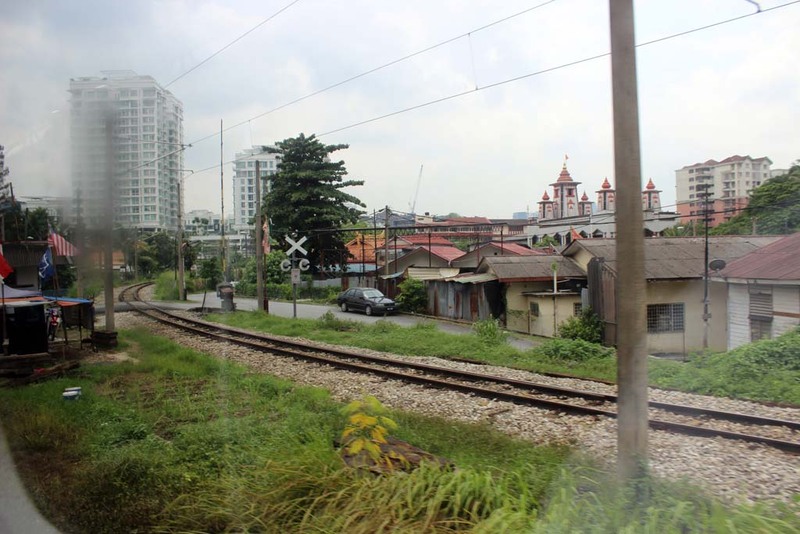 This connection makes the junction near Sentul pretty much like a wye track. 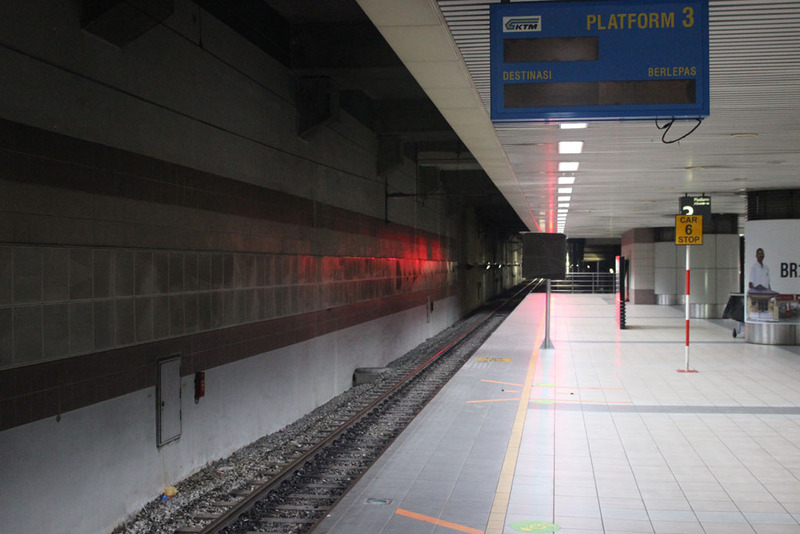 Back in 2004, the Sentul was the only station on this branch that is served by KTM Komuter. 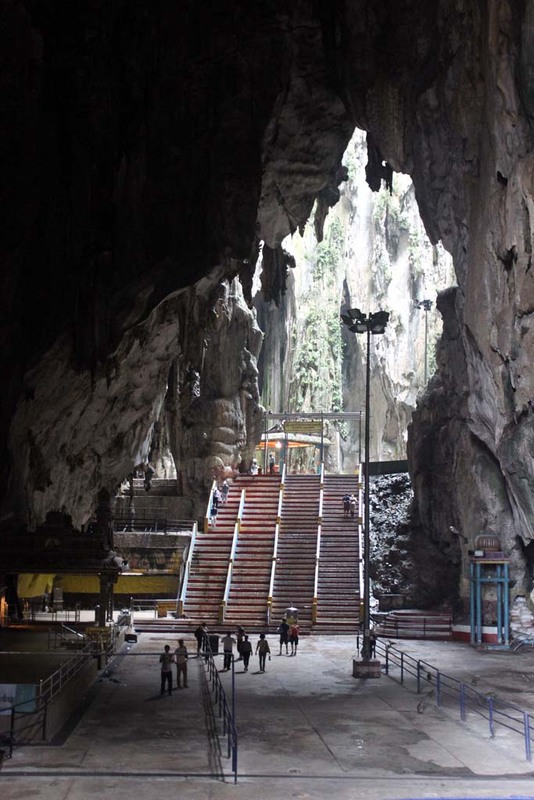 The remainder until Batu Caves was only electrified recently. 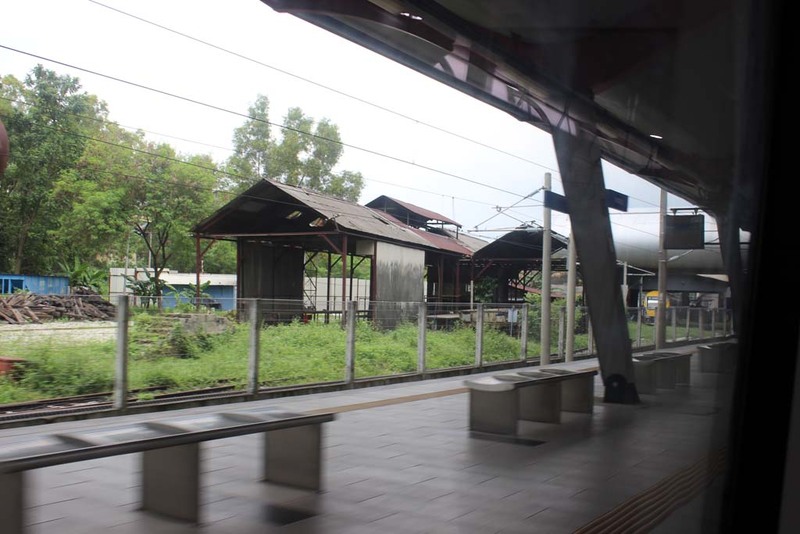 The last time I went to Sentul station, it is an old station that was “adjusted” to suit commuter train service by building high platform adjacent to the old headhouse. 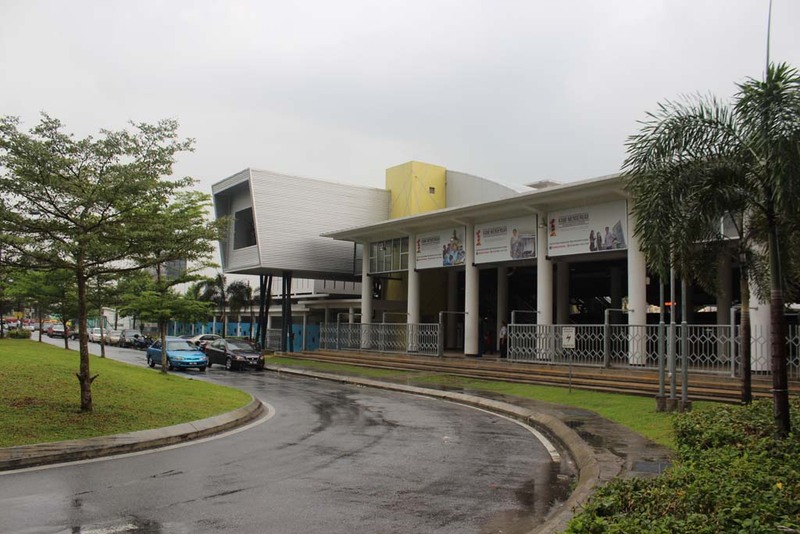 The station is located next to the old Sentul workshop. 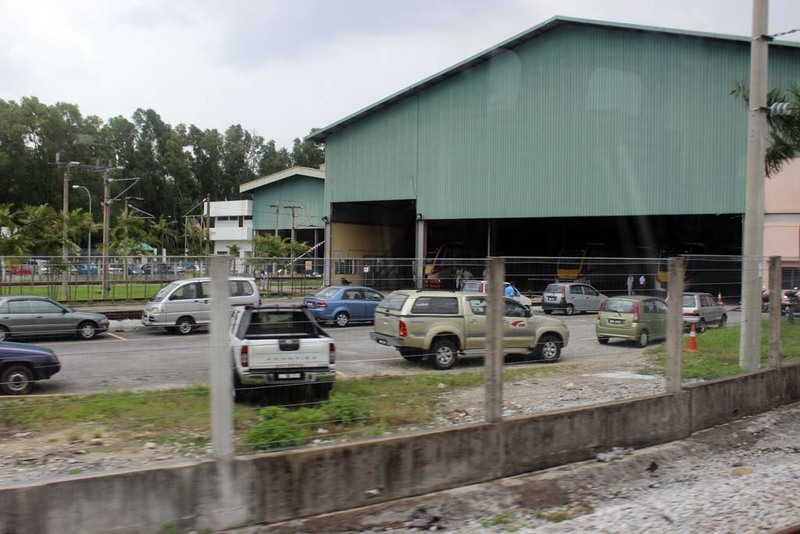 A few years before this visit, the workshop was closed down as they relocate the workshop to Batu Gajah, and to third party workshop at Klang. 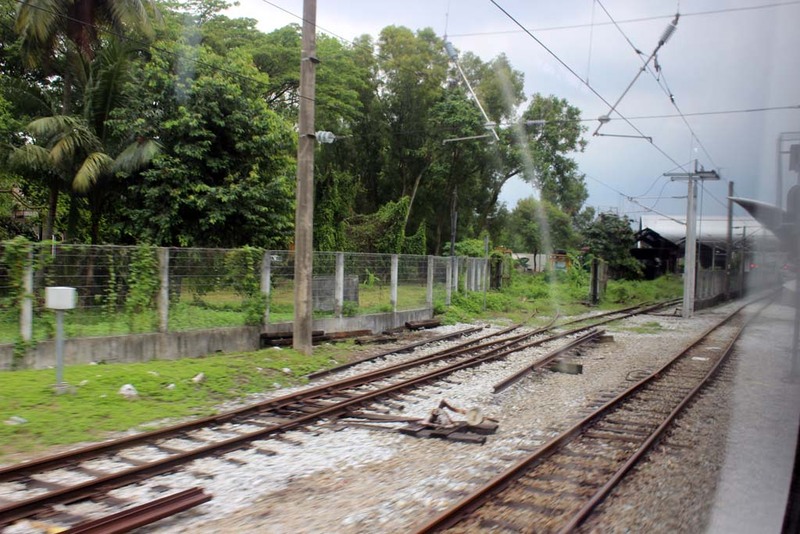 So by the time I revisited Sentul, I’m a bit surprised that the tracks that lead to the workshop is now overgrown. 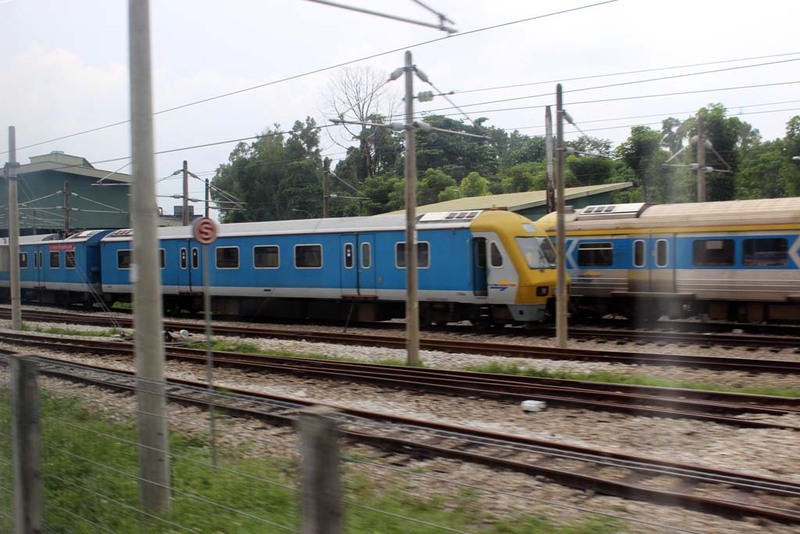 I remember, back in 2004, I saw the second batch of Blue Tiger being prepared on those tracks. 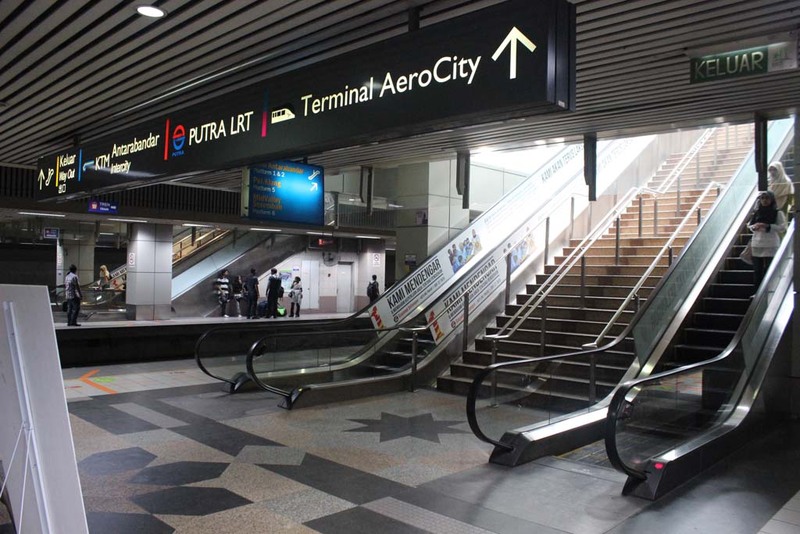 Even Sentul station is now unrecognizable. 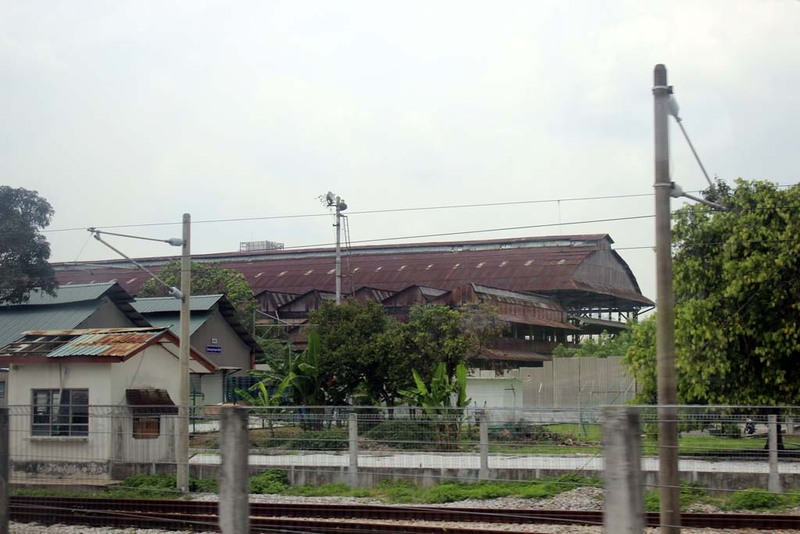 It seemed that the old Sentul station have been demolished and replaced by this modern building. No expenses are spared here! I remember, right on the spot where this EMU parked, there were a row of derelict locomotives. All of them were scrapped when the workshop closed. You could see the old Sentul workshop building in here. I don’t know what will they do with this building? Would they renovate them and turned them into historical precinct, or simply demolishing them? 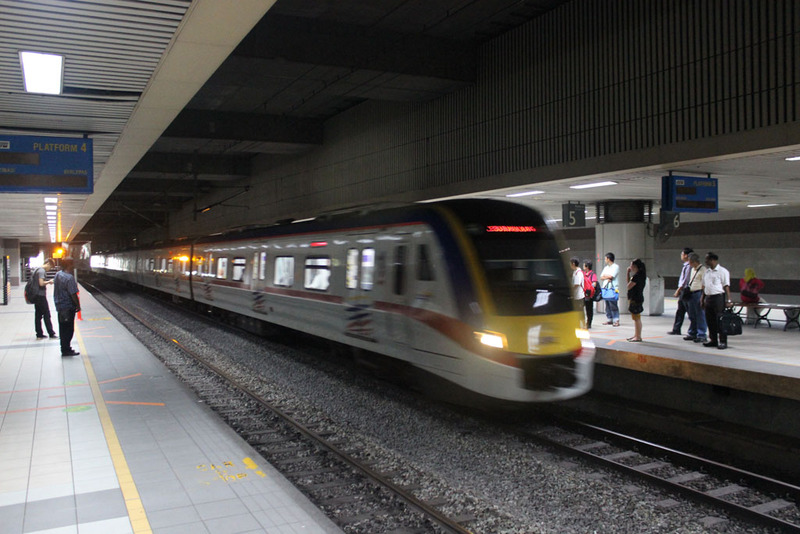 By, the way, this is the first time that I traveled by train beyond Sentul station. 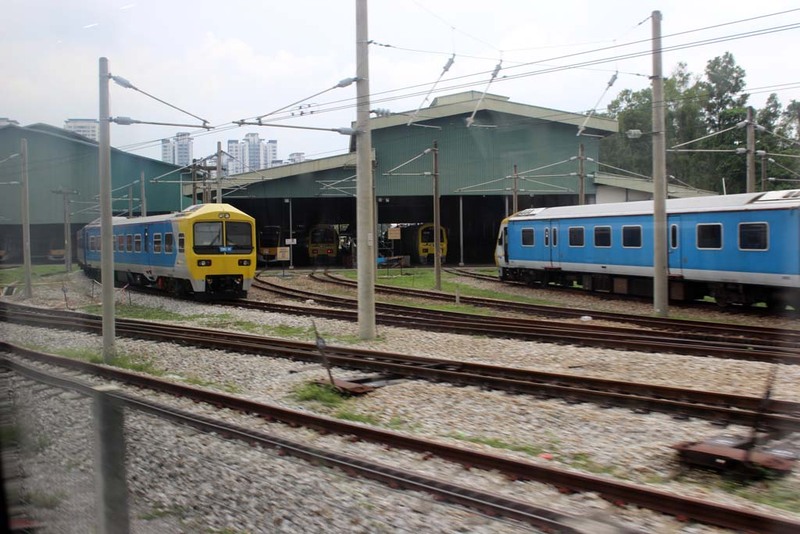 However, not all part of Sentul workshops are closed down. 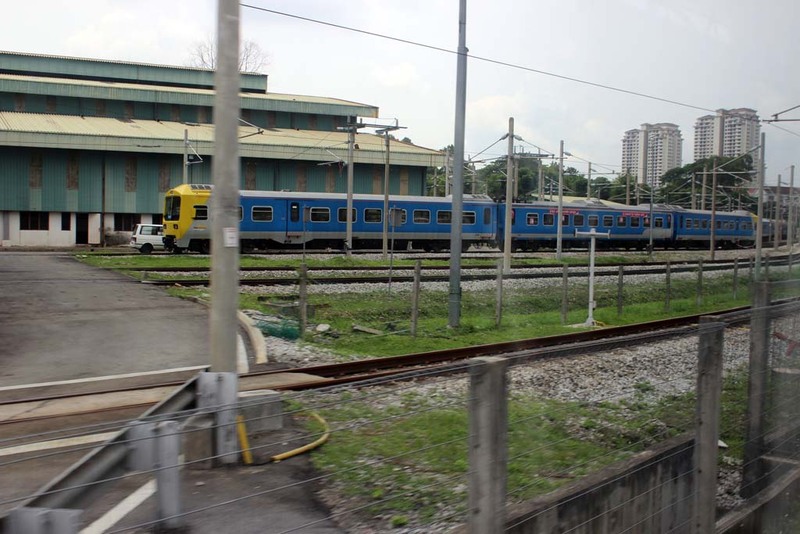 The EMU depot which was built in 1995 as the central depot for KTM Komuter train sets is still retained. 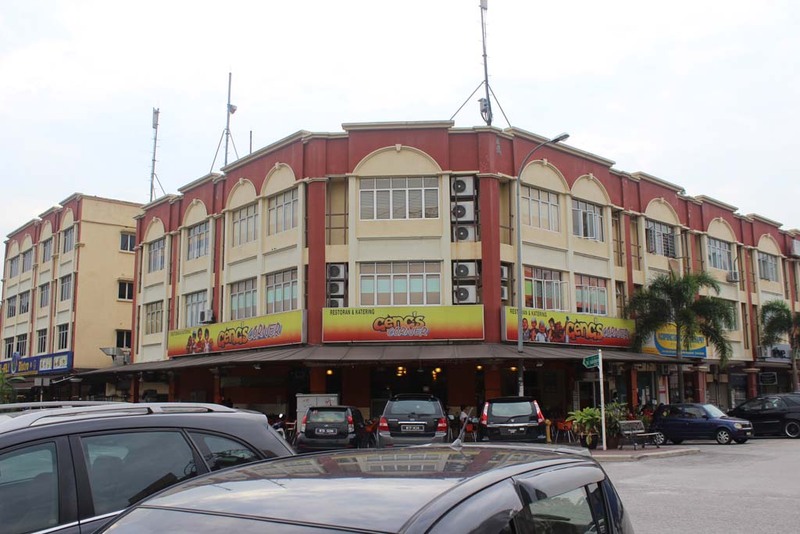 Although it is not as busy as it used to be, because its status has been downgraded when they built a new integrated depot and workshop in Batu Gajah. 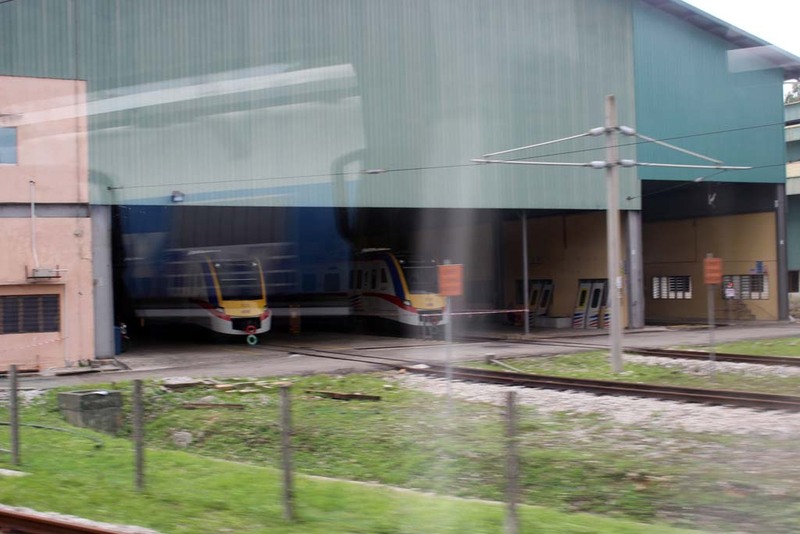 Somehow, you could still see the remains of previous chapter of KTM Komuter operation, in form of disused EMUs parked at its yard. Like this Jenbacher Austria-built EMUs. Its replacements already ousting them from the depot. 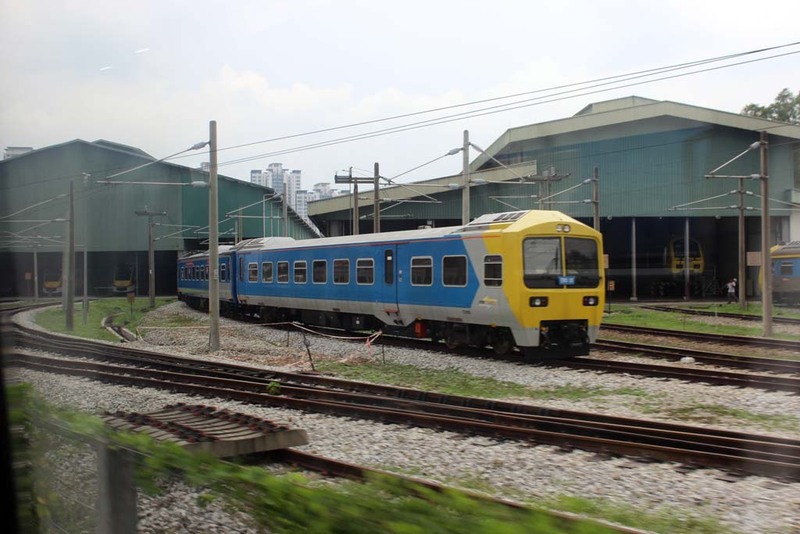 It’s sad to see that this Jenbacher Class 81 EMU is no longer in operation. Back when I was working in Kuala Lumpur in 2004, this EMU was my favorite because its seating is identical to an intercity train. It was very comfortable for a commuter train. Sometime I’d ride this train with my (then) girlfriend. Time has changed since, my girlfriend is now married to another guy and the EMU is now retired, possibly going to be scrapped…. And apparently, Sentul EMU depot has become a storage place of sort, because there are other types of EMUs parked in its yard. Including the highly streamlined South African (Union Carriages) built Class 82 EMU, and Hyundai (Korea) built Class 83 EMU. Some Class 83s are still in operation at the time when I took this photo. But I’m doubtful if those in the picture are amongst them. This might be my final photo of this beautiful looking EMU. I remember, back in 1995 the Malaysian government did advertise this EMU on Indonesian television on one “Titian Muhibah” join TV show. 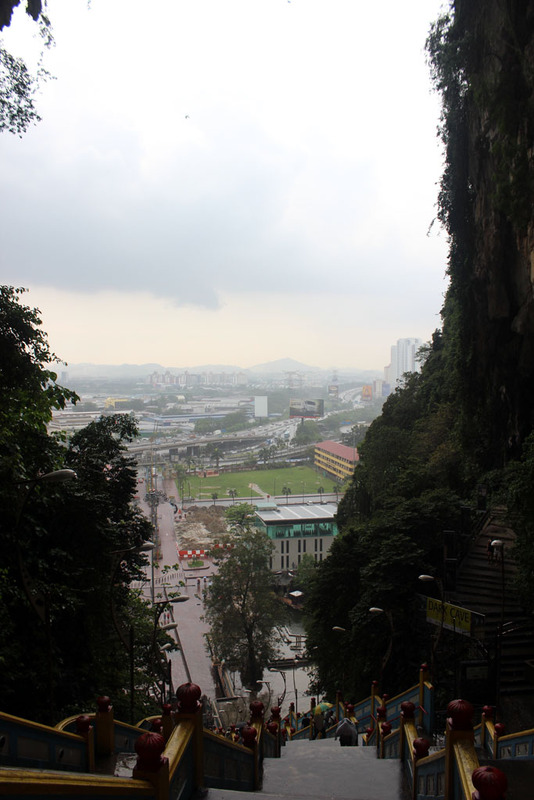 Not long after that we finally arrived at Batu Caves. 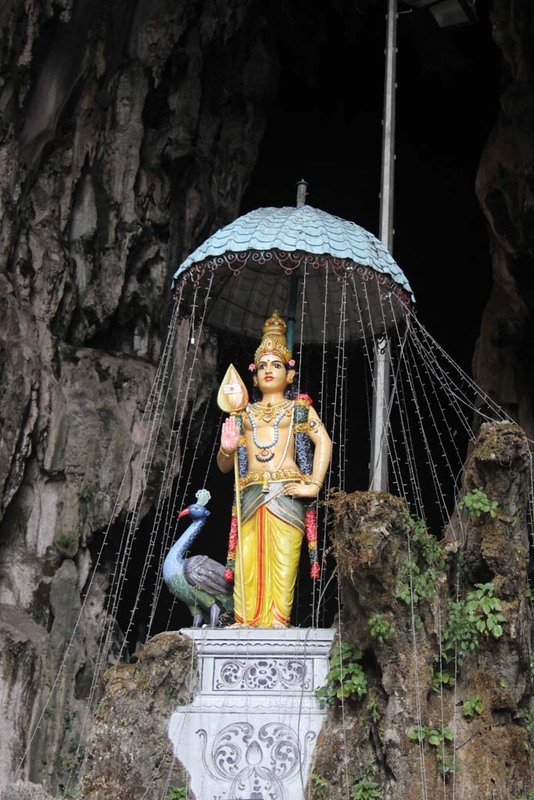 This cave is not just an ordinary cave because it is actually Tamil temple. 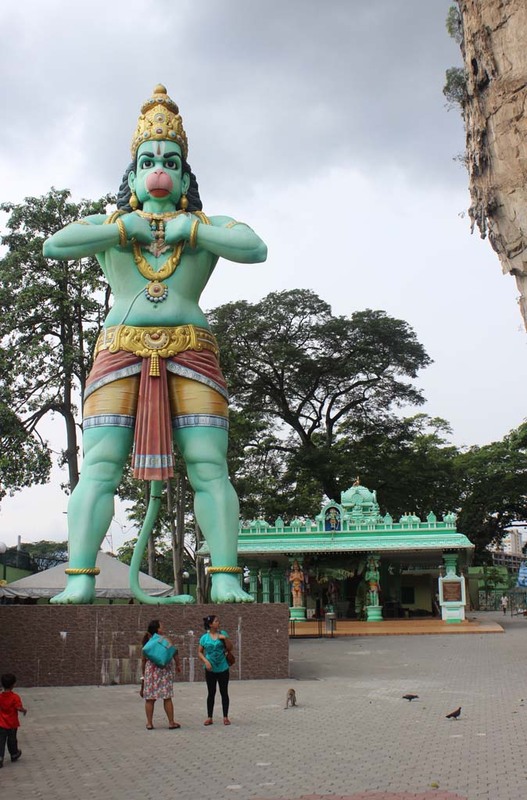 Around its precinct you can see many statues that represent Hindu deities, such as this giant Hanuman statue. 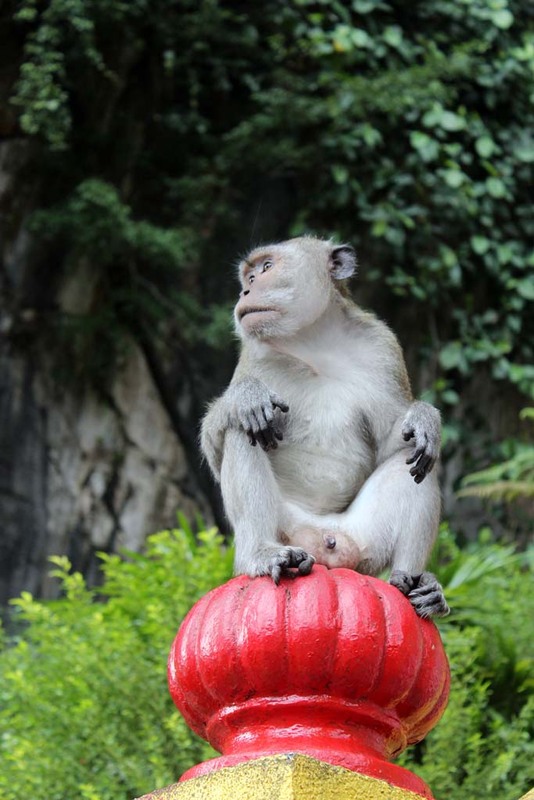 Hanuman is a monkey, and co-incidentally, there are many monkeys around there. Fortunately, they’re mostly tame. Although the cave was not crowded, there were many tourists visiting the place, including this Swedish tourist. 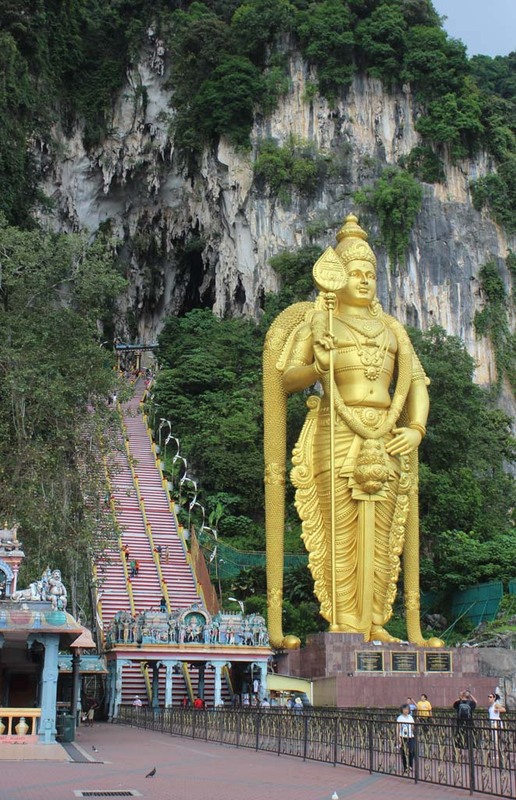 We finally arrived at the main entrance of Batu Caves. 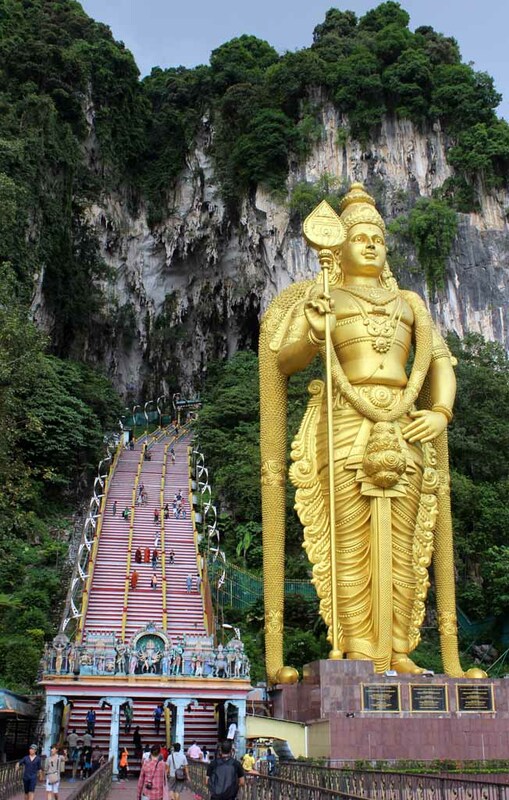 The cave is up on the hill, behind this giant gilded statue. 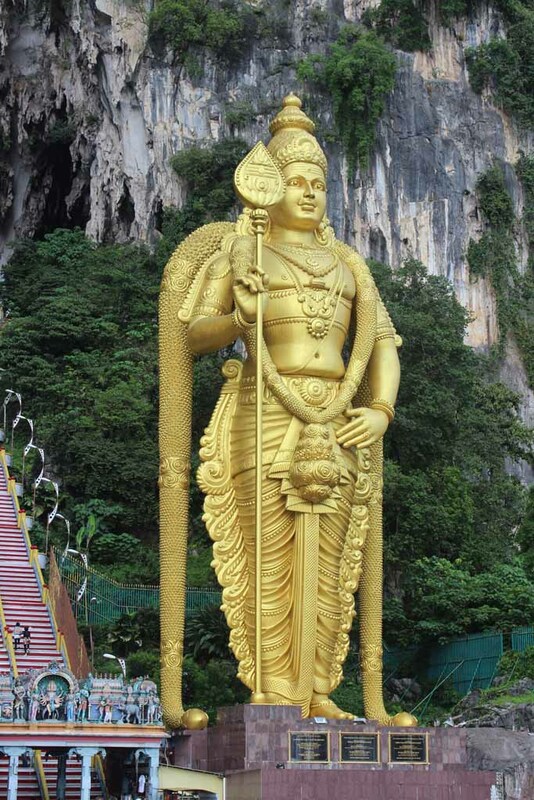 I don’t know is this the statue of Vishnu? Or Siva? During major holidays, this spot would normally packed by tourists. But this time, it’s pretty quiet. 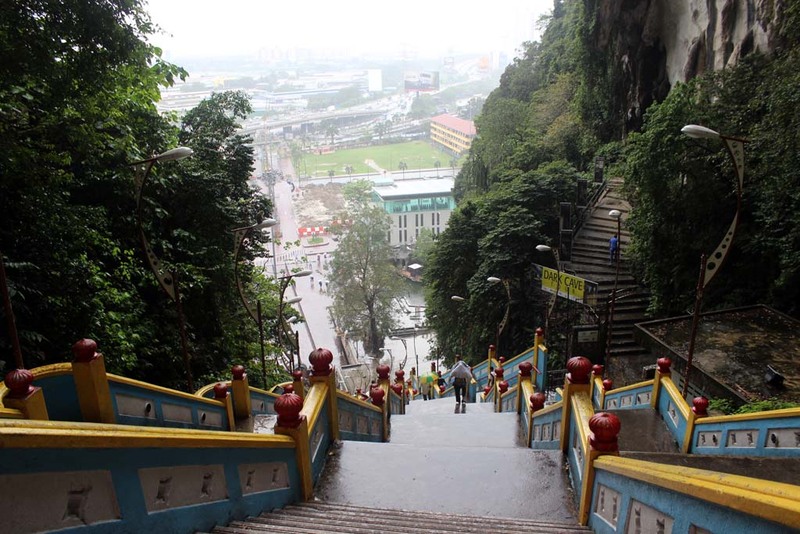 Still, we must tackle this challenge of climbing the stairs! 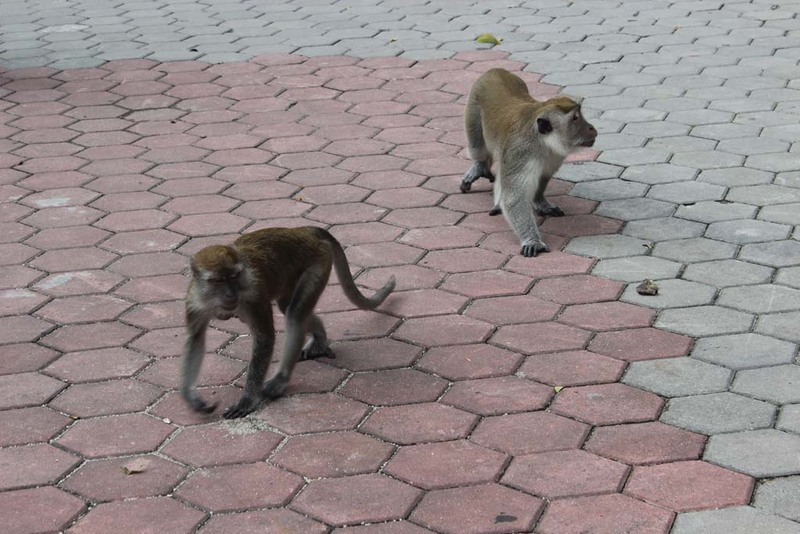 During the ascent, we did come across some monkeys who relaxed; they seemed to be undeterred by human presence. Some tourists took pictures with some Buddhist monks who also visited the place for religious purpose. 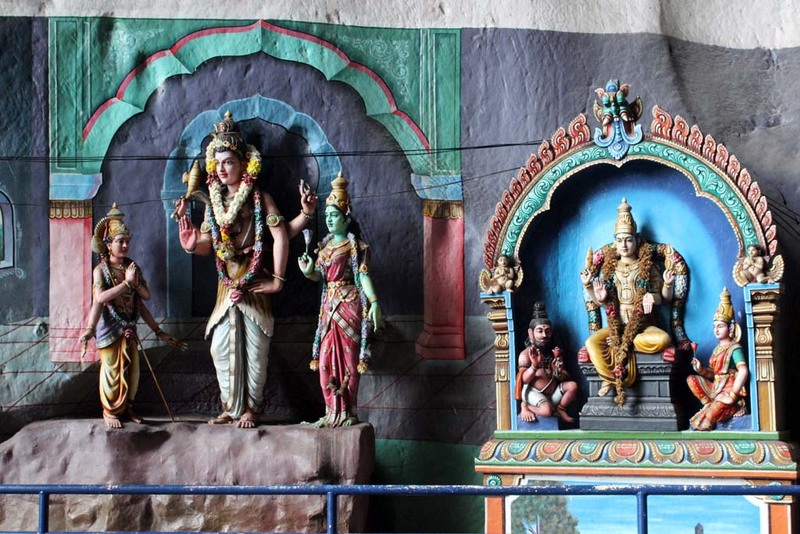 Upon arriving on the top, we were greeted by the statues that remind me of characters from Mahabharata or Ramayana stories. 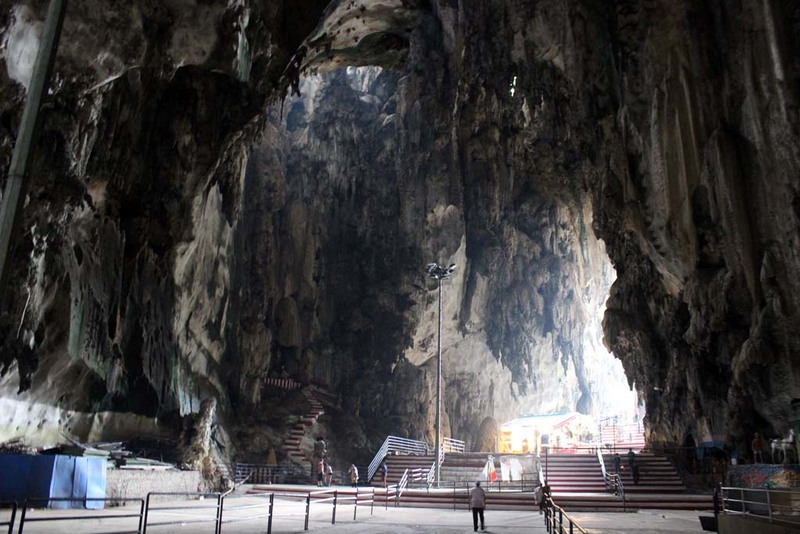 This impressive cave could hold many tourists or pilgrims during Deepavali festival. 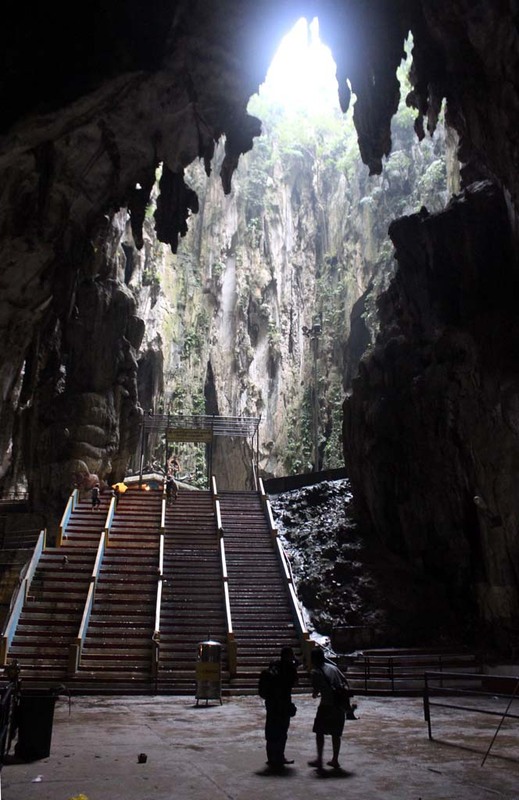 Right in the middle of cave is a large opening that opens upwards. It was rainy and windy by the time we arrived on the top, so we didn’t go to that part of the cave. In this image, you could see the immensity of the room inside the cave when compared to the person on the lower middle of the image. After we finished browsing the cave, we decided to return back to the train station. Unfortunately, it was rainy (complete with frequent lightning too), so that would make the descent potentially hazardous. Rather than waiting for long (we had another plan to go and it was already in the afternoon) we decided to purchase plastic raincoat from one shop and wore them for our descent. The plan worked and we finally made our way back to the train station. 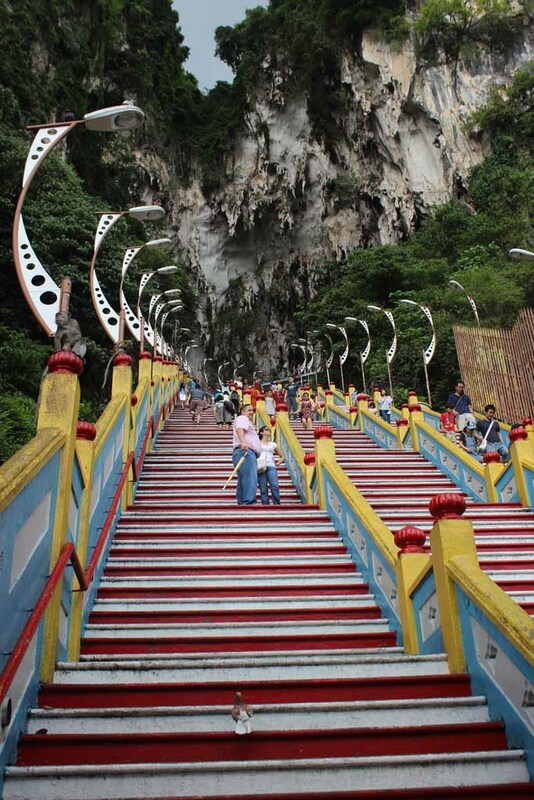 Just some added note: back in 2004 Batu Caves railway station didn’t look like this. It was just a modest wooden railway station, typical of British colonial era station. Our next plan was to visit the famed “Upin Ipin” shop and studio in Shah Alam. Since the station is one the same line as the Sentul line (albeit on different side of KL Metropolitan area) we rode the same train throughout. For this visit, we would be accompanied by my local friend, Kelvin Khew. Since he had just finished his class, we decided to disembark at Setia Jaya KTM station, where we would catch up with Kelvin. Generally the station on this line saw very little altercation, but the commuter trains have changed considerably. We met Kelvin in this station. I was quite delighted to be able to see him again, after my previous meeting in 2011 when he was still working in KTM. He talked a lot of things about KTM or railway in Malaysia. There were many interesting stories that I heard from him throughout our journey to Batu Tiga station. 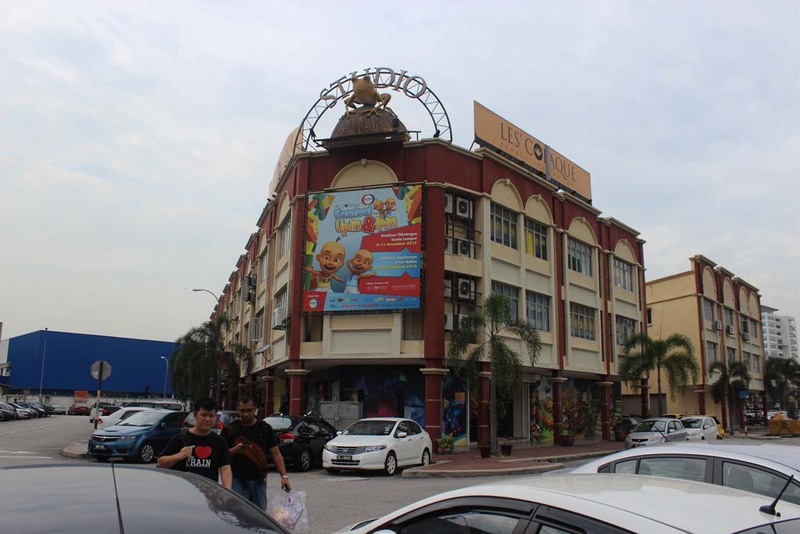 Once we arrived at Batu Tiga, we took a taxi to the Upin Ipin studio. Despite of its popularity, we won’t see anything that resembles Disneyland over here. 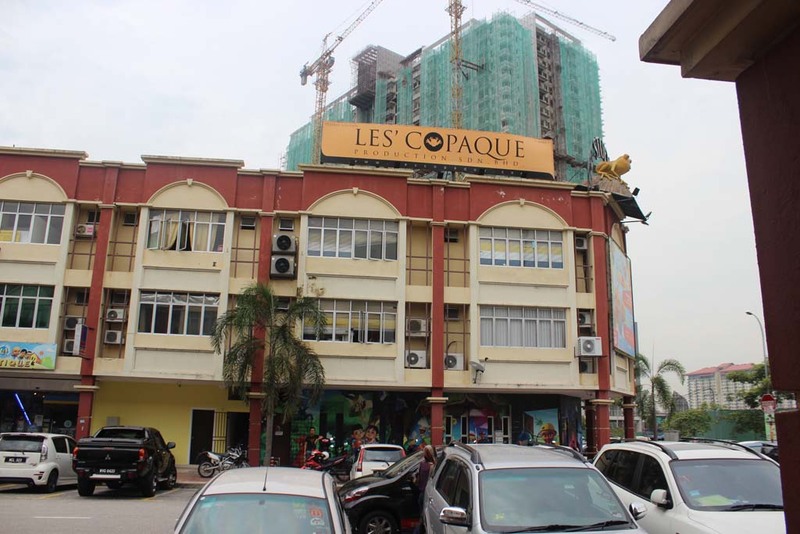 It’s just an ordinary commercial center with the name of the production studio which created Upin Ipin carton clearly displayed on the top. No theme park or something like that. The Upin Ipin merchandise shop is there. It’s just an average sized shop that sells many merchandise of the cartoon. We bought something for our nephew in the shop. Once we bought everything we headed back to KL Sentral. On our way to bus stop, we did saw one restaurant with Upin Ipin theme. Since we’re not hungry, we didn’t paid visit. 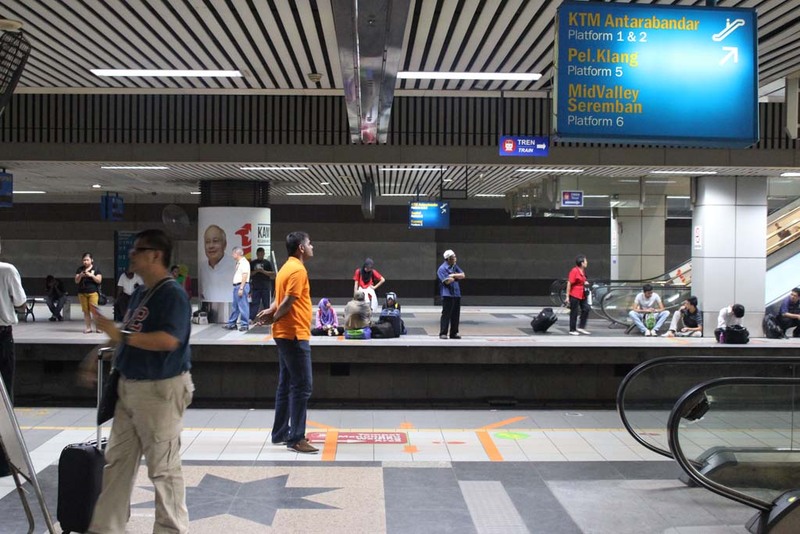 After returned back to Batu Tiga station, we took the train back to KL Sentral. My itinerary on that day was quite packed. After visiting Batu Caves and Upin Ipin, I also had appointment with bang Mokhzani to visit Putrajaya. It was really hectic, but worth it. However, I did some mistake in calculating the time. Since Malaysia follows GMT +8 timing (an hour later than in West Indonesia time), so it is quite surprising to see that sunset happens at about 7pm. I never fully adjusted with this unusual timing throughout my journey. As a result, I felt like being dragged just to keep up with my schedule on that day. 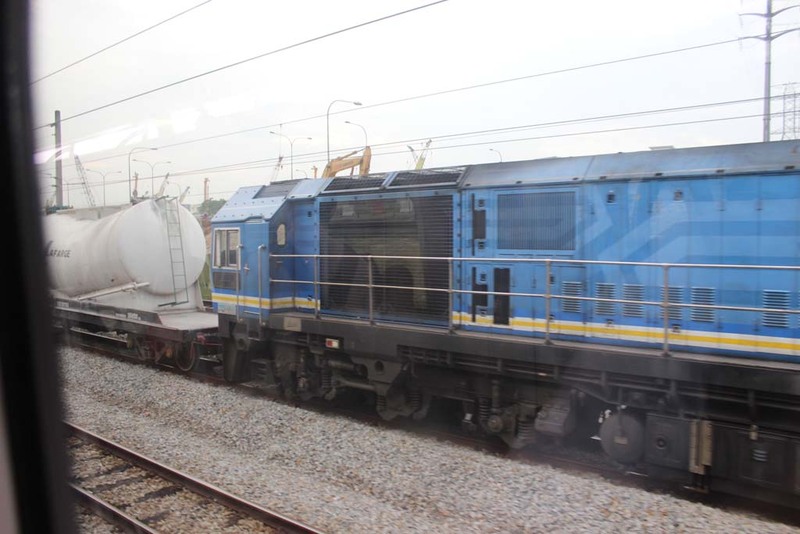 During our trip back to KL Sentral station, we did come across this freight train at Subang Jaya station. 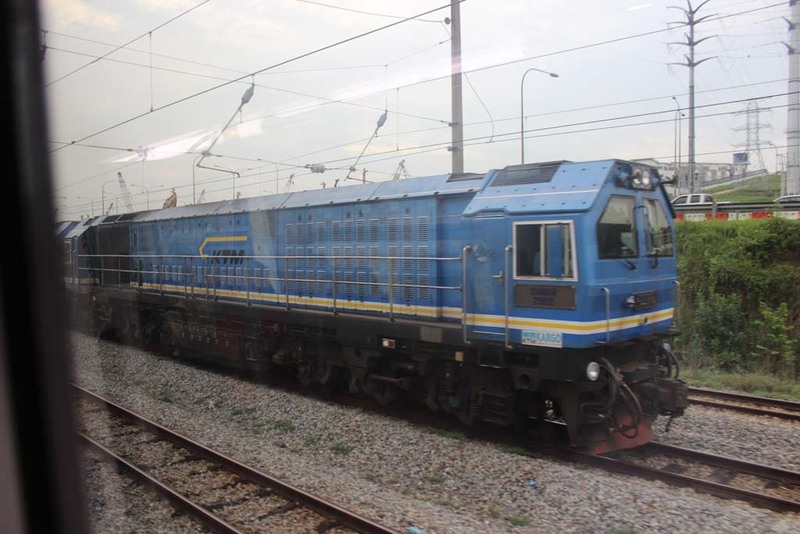 Apparently, it is hauled by the Chinese built Class 29 locomotive. Not just that, the loco is also worked in multiple units. Such thing, according to Kelvin, is rare, especially since it involve two high horse power locomotives like Class 29.